Sound Socialization – The original award winning sound socialization for dogs. Treating the source of dog noise fears, not just the symptoms. Rated OUTSTANDING by top animal professionals. Chosen by breeders, rescue groups, veterinarians, humane societies, training clubs, service groups, training groups and more. Sound Socialization™ is an important foundational component for puppy training and dog training to instill a calm, confident and responsive dog in our stimulating world. Socializing your pet and reviewing training regularly is an excellent treatment to prevent anxiety and panic attacks to those sudden loud sounds. The behavioral concern of dog fear of noises is preventable and correctable. Now you can habituate, desensitize and counter-condition your puppy or dog safely and comfortably in your own home or kennel with the expert trainer and developer O’Neal Scott leading you step by step to confident success. Audio training by master trainer outlining specific step by step instructions to develop a positive imprint with puppies for use by breeders and families bringing a new puppy home. 126 individual sounds known to trigger dogs and organized conveniently into seventeen tracks for ease of training. Convenient print reference guide of training and tips. Why use Angel Dog Sound Socialization to train your dog? We are the originators of the training back in 2001 providing quality training to sound-phobic dogs and their families who suffered alongside them. Hundreds of hours of research and development went in to create this professional training program to remove the fear and help the dog & household return to a normal life. The BEST sound socializing training available worldwide, including ESSENTIAL training steps you will learn to achieve positive imprinting success. Counter-condition an anxious dogs reaction to thunderstorms, fireworks, sirens, gunshots, children and more. Help the sound reactive dog, and you, to a better quality of life. Prepare your dogs for show, trial, therapy, service and being a canine good citizen. Breeders – prepare puppies for everyday life sounds while providing added value to your pups and clients. Trainers – add this tool to your obedience classes. You know the importance of a calm dog. Discover all your dog’s sound sensitivities, then help him overcome the fears to provide your dog with an improved quality of life. It’s a great help to adopted dogs. Gently acclimate kennel/outdoor/rescue dogs to household sounds. Introduce your dog to airport sounds before their travel so they enjoy a more relaxed easy journey. Hunters can keep the dog and train out the sound fear of gun-shy dogs. Over 124 individual sounds known to trigger dogs and grouped in tracks by categories. Gentle, loving, and effective training. Deepen the loving relationship with your pet. Your fur family member is also learning to trust you as a leader when you care for them and their life. Provide loving and compassionate care for your companions including keeping them calm and safe in our over-stimulating, loud world. We have approximately 89.7 million dogs living in homes in the United States as family pets. Fact is, sound phobia is a common behavioral condition in dogs. Recent studies show dog parents report over 60% experience some form of sound fear. Millions and millions of dogs suffer from noise anxiety. 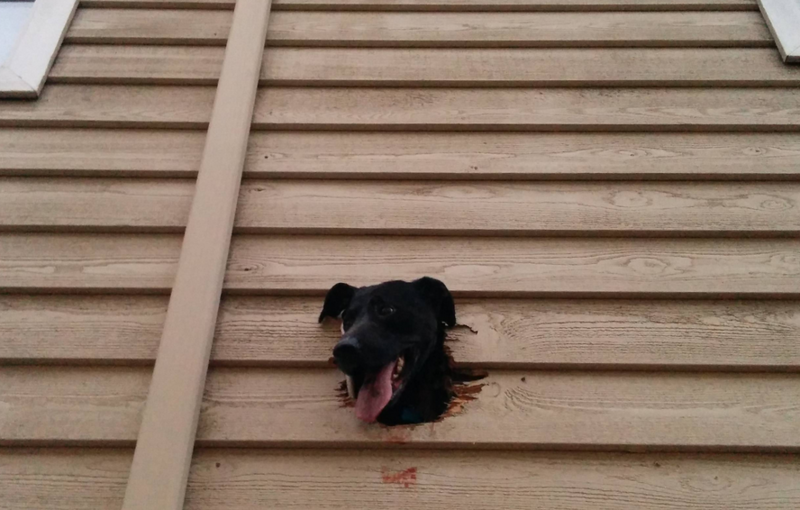 There is a good possibility dogs in your neighborhood have noise concerns. Is your dog one of them? Ask any vet and they can share stories of dogs jumping out windows, running into traffic and getting hit, chewing through crates or doors and ripping their teeth out while damaging other areas of their body, attacking others in fear. July 5th is the date the greatest number of dogs is dropped off at shelters due to behavior problems. Angel Dog Sound Socialization™ is a training program that addresses the source of the problem. 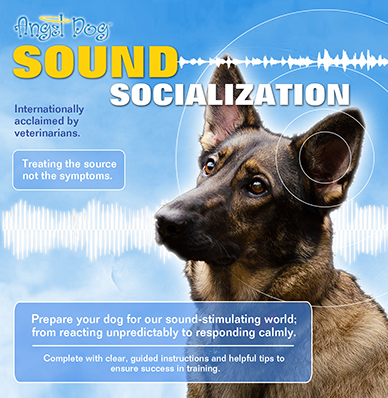 Angel Dog Sound Socialization™ was developed and produced by master dog trainer O’Neal Scott to provide a solution to the very real problem of sound distress in dog homes. There was no solution to the real problem – dogs afraid of loud, sudden sounds. And as those who have a dog with this problem, you know it affects everyone else in the household and often the circle of impact is even greater. Steps were taken to thoroughly research of the problem, case studies, and time spent searching out the highest quality sounds to record with the best equipment and then taken to a studio. The sounds were then set into tracks by topic and digitally mastered to provide the most ideal exposure to real life sounds known to scare dogs. Then specific training steps for breeders and new puppy families were added at the beginning of the training to ensure the exposure is POSITIVE. (Simply exposing dogs to loud sounds does NOT prevent sound fears or correct existing sound fears.) We also created specific counter-conditioning training for dogs who have sound phobias. The training is gentle and will not damage your loving relationship. In fact, this training aids in deepening your close connection of trust. Our world is getting more and more stimulating and dogs need to be trained to understand the sounds don’t hurt them. Just as dogs don’t know to wait at the door, sit as a sign of please, or come when called unless they are given training, it is the same with sound socializing. The greatest benefit of this training is to teach your dog to learn to respond to the loud sounds versus reacting in fear. The step-by-step training is the key to training or retraining your dog to overcome the source of the problem. This, in turn, opens up your dogs’ life, and yours. No more passing on events so you can stay home with the dog and hide in a quiet room. Open up your dogs’ world with critically needed socialization. Over 124 unique individual sounds are set in organized tracks to make training smooth and helpful so you can easily target what is needed for your pet. Studio mastered because it makes a huge difference when you listen to a “homemade” audio training versus professional studio mastered. Great care has been put into each aspect of this professional grade training. Begin training today as it takes time to achieve “real life volume”. Some pets train fast and others need more time. Effective socializing is done step-by-step with specific training to ensure your pet has a healthy reaction/response before moving to the next step. This is a reason why the training provided is critical to your pet’s success. Click here to purchase, download, and get started today! Featured in DogWise, Dog World, Dog Fancy, Pet Gazette, Pet Product News International, Royal Canin, European Dog Show 2016, Animal Cops, Discovery Channel, Pet Talk, numerous service dog live video cams, and more.